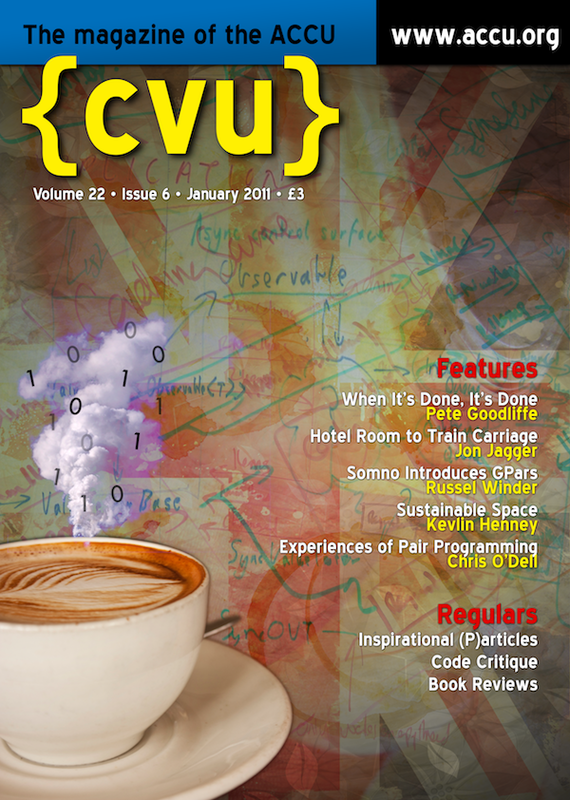 The January issue of ACCU's C Vu magazine is out now. It contains the latest installment in my Becoming a Better Programmer column. This one's called When It's Done, It's Done, and is a description of how to do the "right" amount of work; to work out when your current task will be complete, and when you should stop working on it. The magazine should have landed on ACCU members' doormats already. The PDF version is available for download on the website. My article was about the GPars, Groovy parallelism on the JVM, and you can use GPars from Java, does that count as Java-y? I should have picked Paul up on his editorial, in which he said "What you won't find is anything about Java."